It is always tradition to try and squeeze one last adventure into a holiday before making the long journey home. This years february half term ski trip was no different! We had exhausted the pistes of the Portes du Soleil during the week so decided to check out the ski tour on Col Rati. The parking is at the top of the Col d'l Encrenaz above where we were staying at Les Marmottes in Essert Romand. 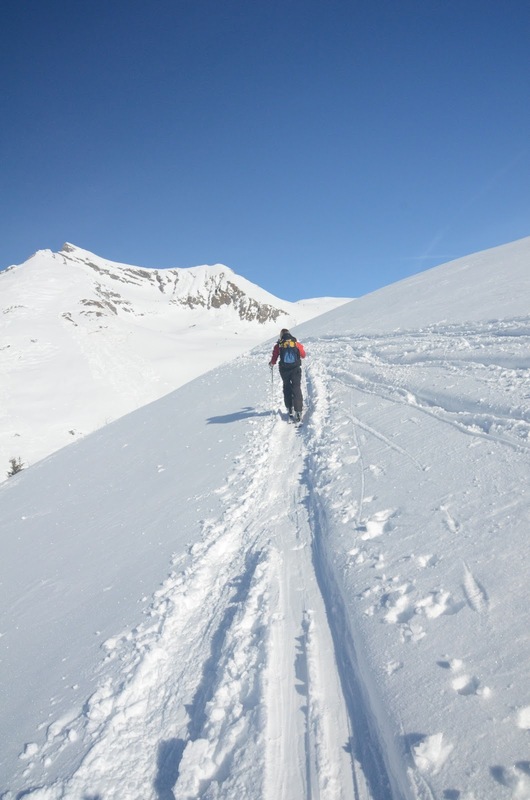 Skis were put on straight away from the car park and the route is an easy plod up to the Col de la Basse. The views were spectacular over the Mont Blanc massif all the way up to the first col.
We had been warned over the avalanche prone slope to our left as we were climbing up towards the top of Col Rati so we ensured we were way out of the way. The gradient certainly increases as you head from the the Col de la Basse. The route was quite busy but this meant a clear path led to the top. It was a steep slog to the top but there was plenty to keep you occupied with a fantastic vista in every direction. At the top we headed for a summit pic before the skins were put away and the helmets were put on for the route down. The ski down was interesting! The snow was not as fresh as you would have liked and it made for some hard skiing in places! However the conditions added to the amusement and entertainment of watching each other get down in one piece! We decided to head for the ridge above the Col de la Basse which gave us a longer ski down and more great views. The only issue was you had to pick your line wisely but this just made it more fun! The final part of the tour was down the main track back to the car park. It always feel quite unreal to be skiing past peoples houses and front doors! This ski tour is a classic and popular with the locals which is easy to see why. We have put a video of the route on the adventure movies page. Well worth a visit!